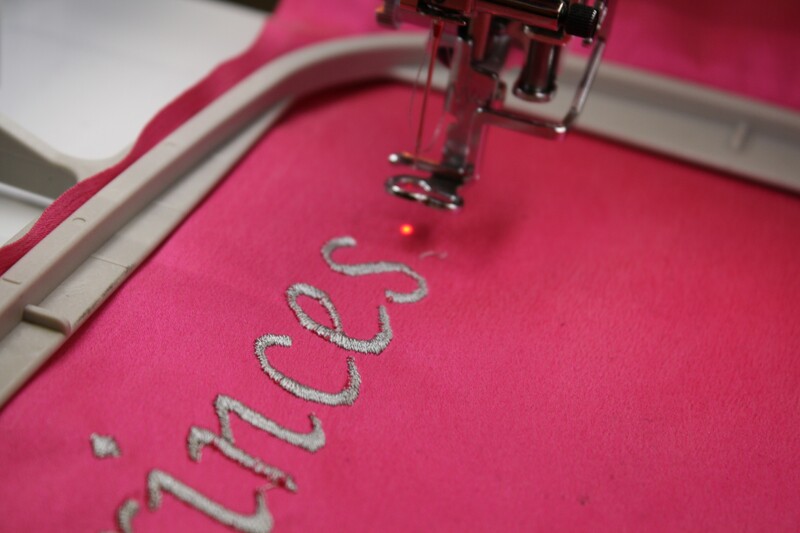 Embellishing – Fabricate with Applique! That definition pretty much leaves the door open for ultimate creativity, wouldn’t you say? 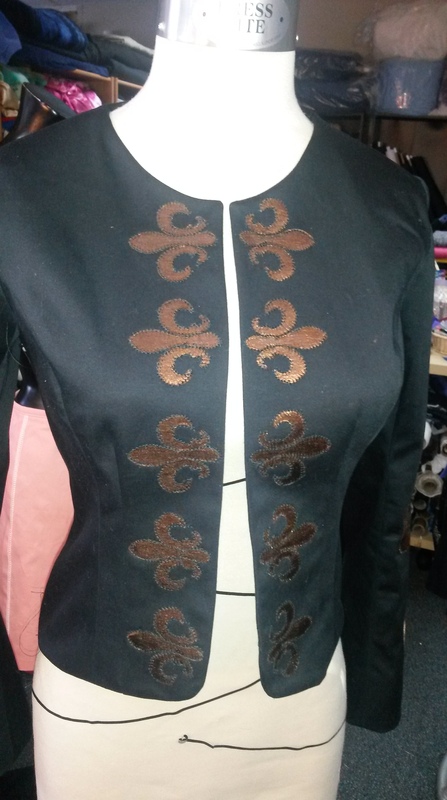 One idea includes designing your own fabric or altering a fabric into something totally different, which is what I did with the above jacket. 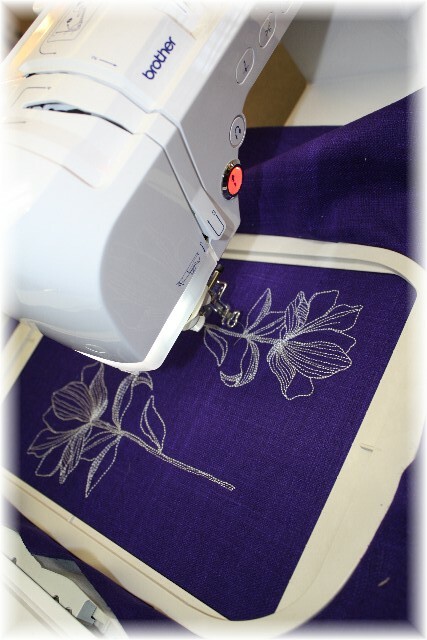 The fabric used for the applique trimming is a polyester / satin. 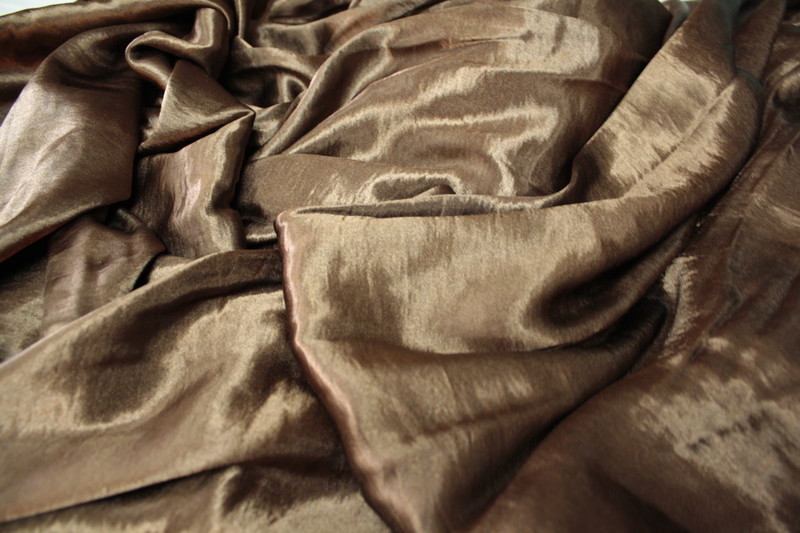 A lightweight fabric with fabulous drape, perfect for a blouse or lining (both of which I plan to add to jacket). That fabric, if left alone, would be a nightmare to create appliques or cut-outs, so I fabricated – sounds like a bad word 🙂 ! 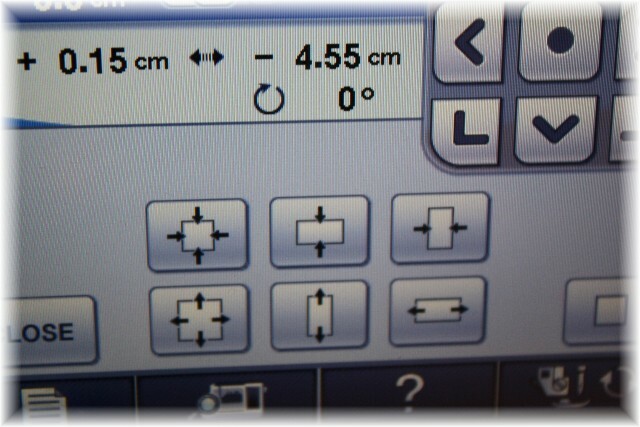 Choose a design – for the sleeve I enlarged a design already in the scan-n-cut memory. 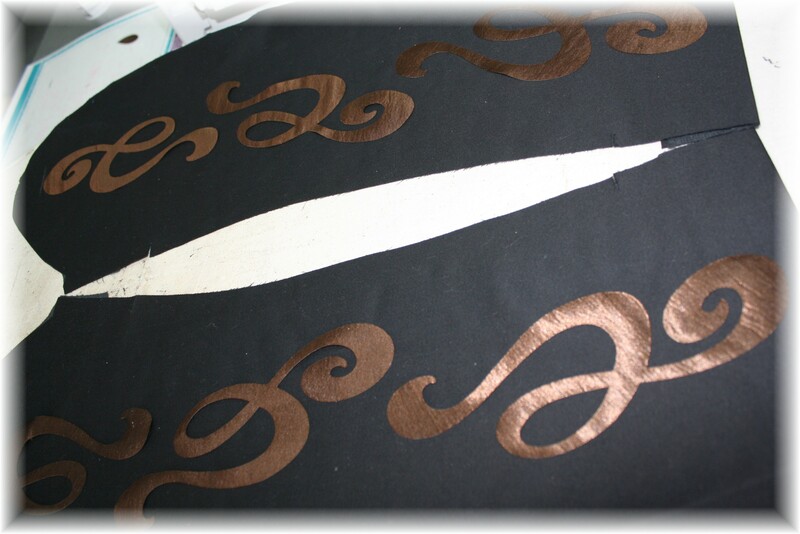 Peel off the backing and place the appliques on the garment. 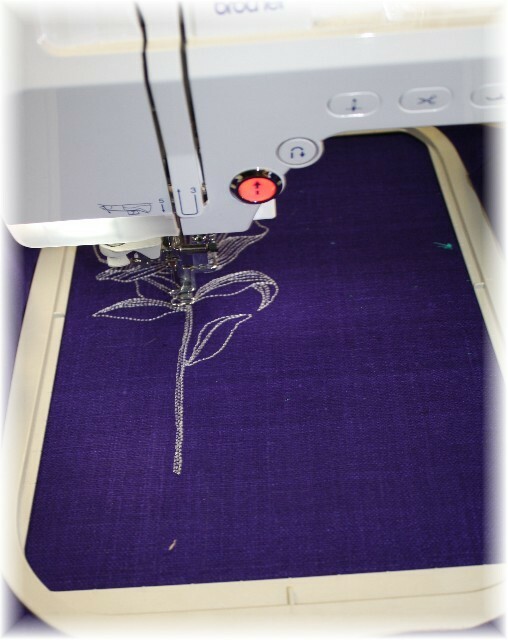 Once you have the perfect placement, use a press cloth and press the applique in place. 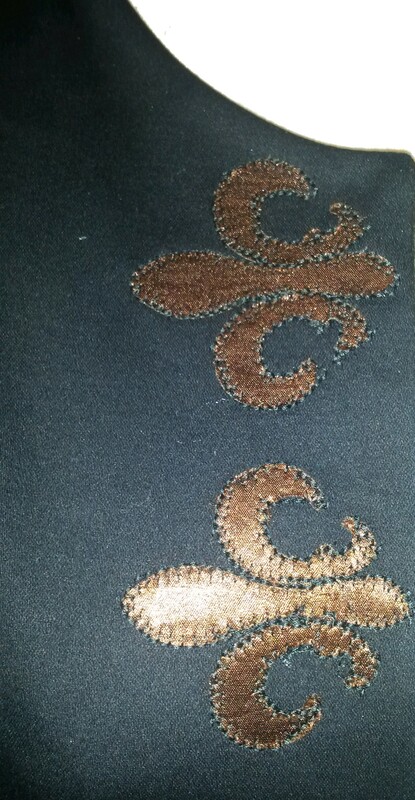 Notice I attach the appliques before sewing the sleeve together. 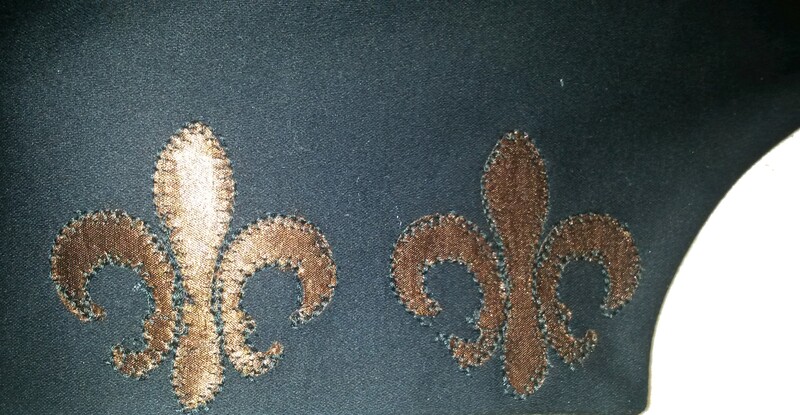 Even though the cut of the scan-n-cut prevents the fabric edges from fraying, I still stitch the applique in place. 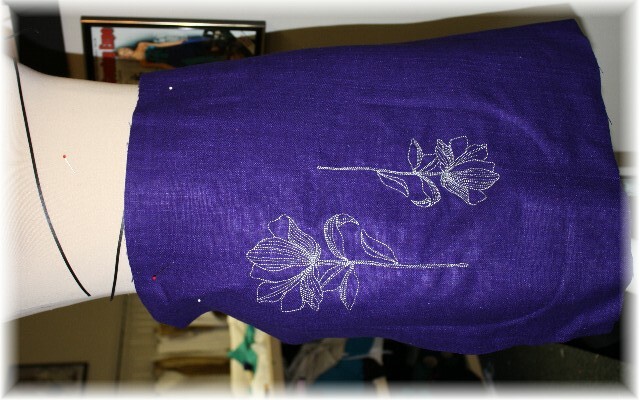 I choose the blanket stitch and stitched around each applique. That took some time, but it looks great. Almost looks like leather! 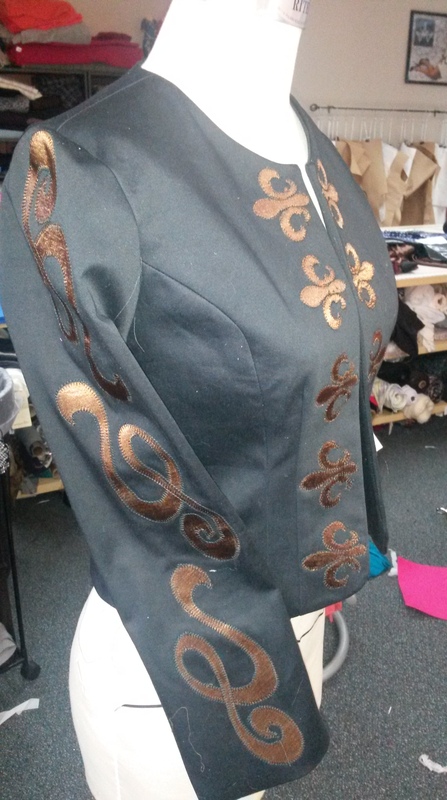 I followed all those steps for the jacket front and again used a blanket stitch. Well, that’s one fun way to fabricate. 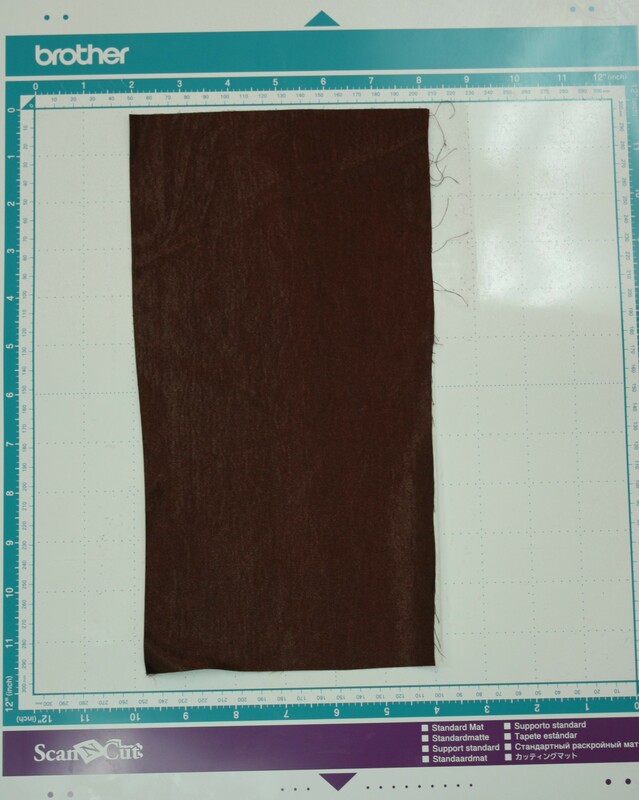 Have you ever tried appliqueing apparel? 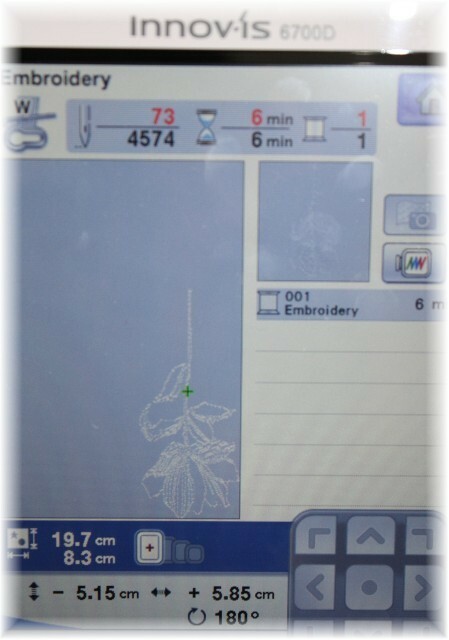 I found this flower in the Brother Quattro sewing machine. The flower was originally a medium size, so I tried to make it as large as possible for one of the flowers and as small as possible for the other. This was so easy to do! Using the touch screen I was able to enlarge the flower and move the design to the top left of the screen, which will embroider in the top left part of the hoop. 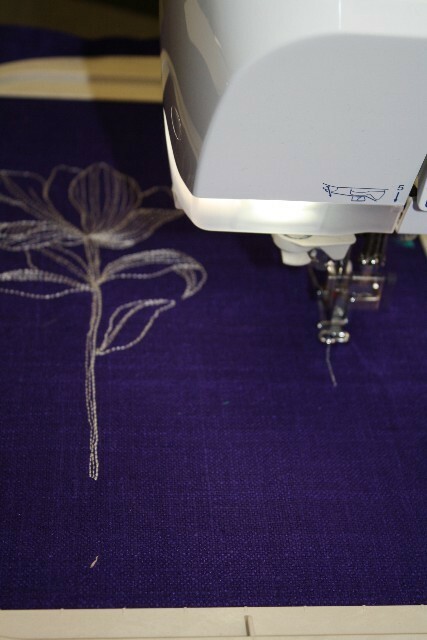 You can see below how the first larger flower is embroidering on the top left side of the hoop. 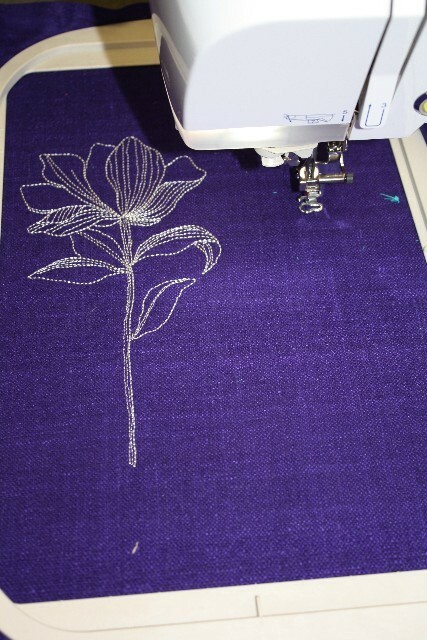 For the second flower – I turned the shape upside down, made the flower as small and narrow as possible, and moved the shape to the bottom right side of the hoop. Looks pretty good!!!!! 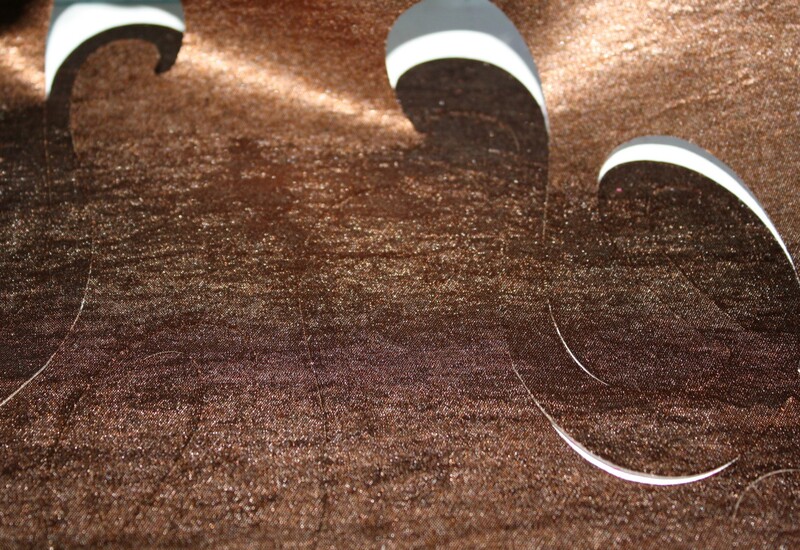 I used a silver metallic thread, although you can’t see that very well from the photo’s – clean and simple. As far as designing, I cut the bottom of the dress to allow for a straight skirt or adding darts or pleats to the waistband. I am definitely adding the darts 🙂 I will post photos when the dress is finished. 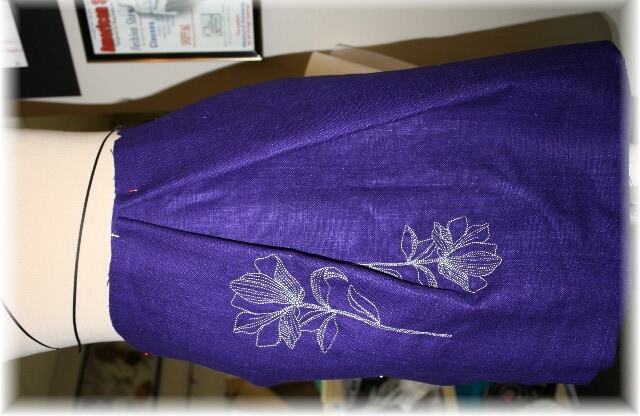 Congratulations Wilma Coats the winner of my Creative Serging Class on Craftsy! Again, here is a coupon if you would like to join us in a fun, creative online class. First off, thanks so much for the embroidery tips! I started with simply adding letters on sueded silk, just trying to get a grip on rotating the word and changing the overall size. I am happy to announce, embroidering letters is much easier than I thought. 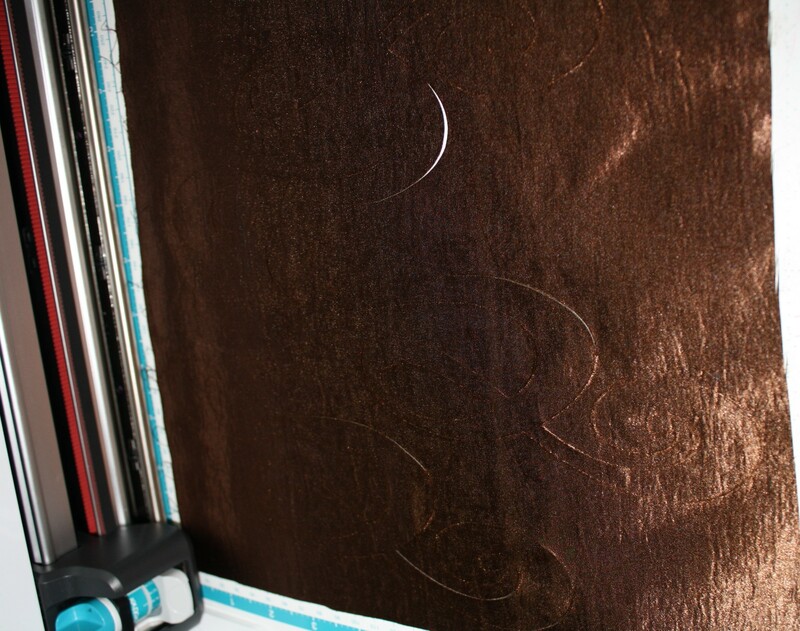 So here is where I screwed up … I was in a hurry and grabbed a bobbin that was 1/3 full. Instead of taking all that thread off the bobbin and starting fresh, I added more thread to that bobbin. Not a big deal, unless you run out of bobbin thread! 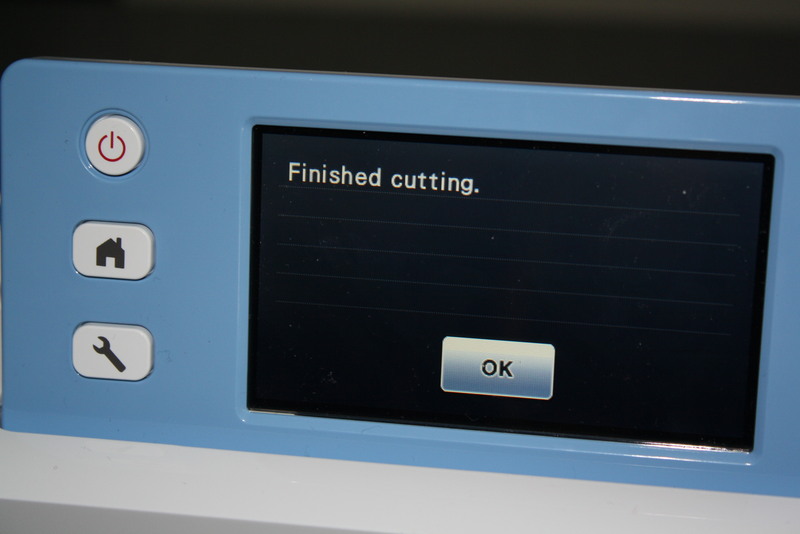 This sewing machine has an automatic sensor that tells you when you are going to run out of thread. 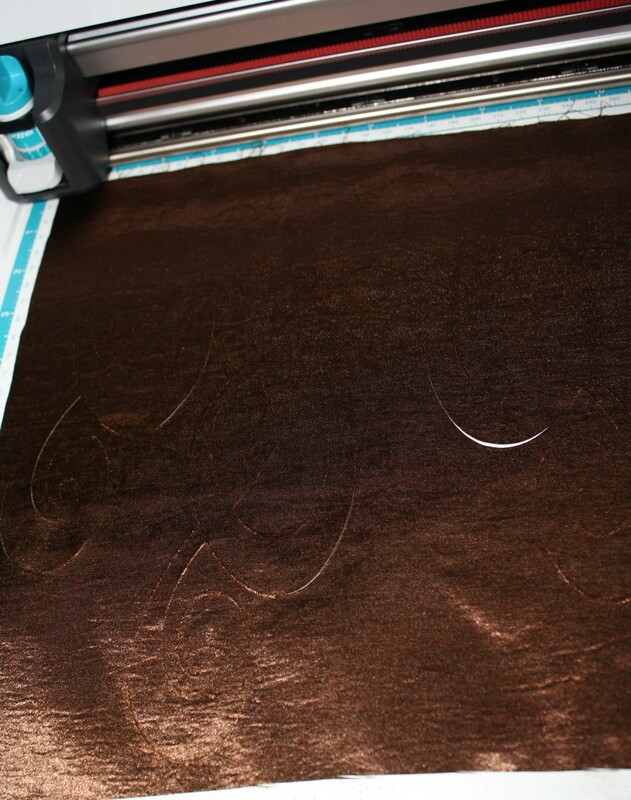 Very cool feature, unless the machine doesn’t know you are going to run out of thread, which is exactly what happened here. 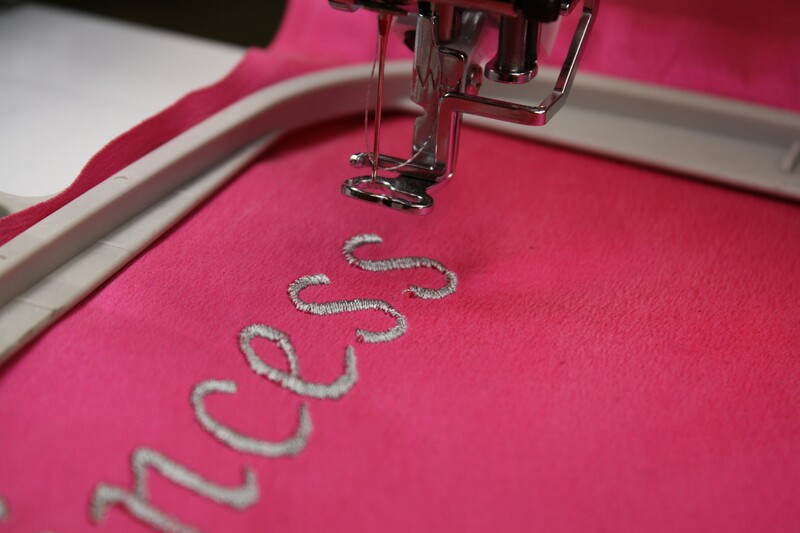 I was lucky the thread ran out at the end of my first “S”, but I still had to line up another “S” or change my idea to Princes (on pink fabric). 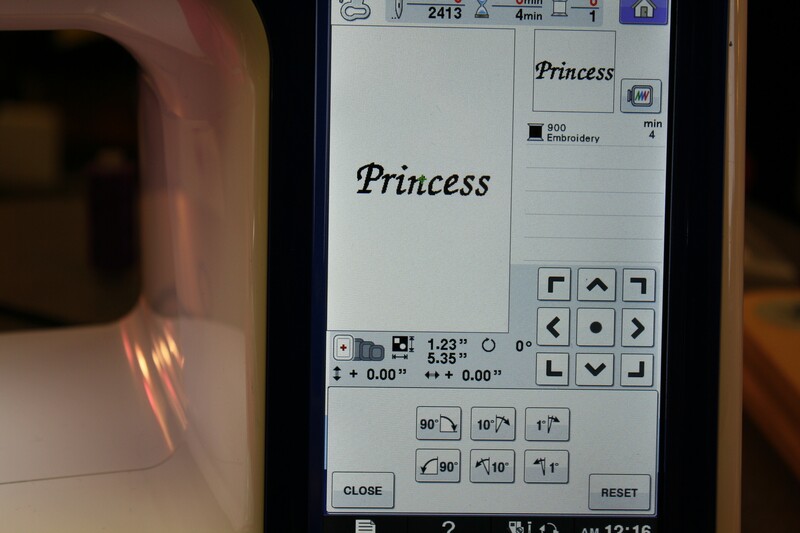 I played around with the laser light and found that I could tell the machine where to start the last letter. Not too shabby! 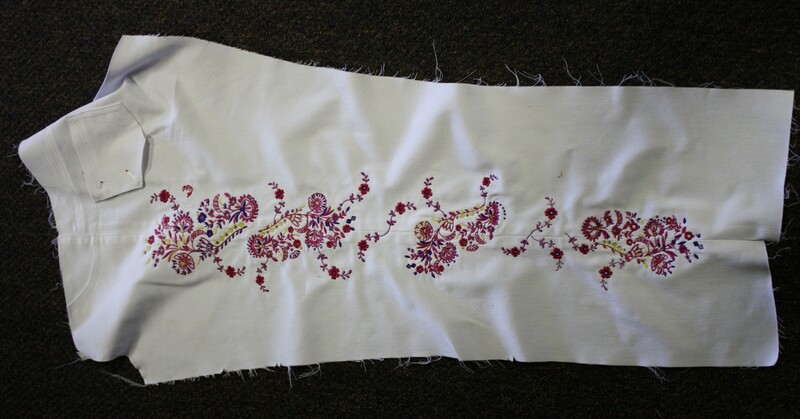 I have big design ideas for my newly found passion for embroidery, but for the first few tests I am going to work on small pieces of fabric and share with those of you that are as much a novice as I am on this. A few emails rolled in about how exactly to embroidery the jeans and I thought this photo might help. Remember there were 3 hoopings on each leg. 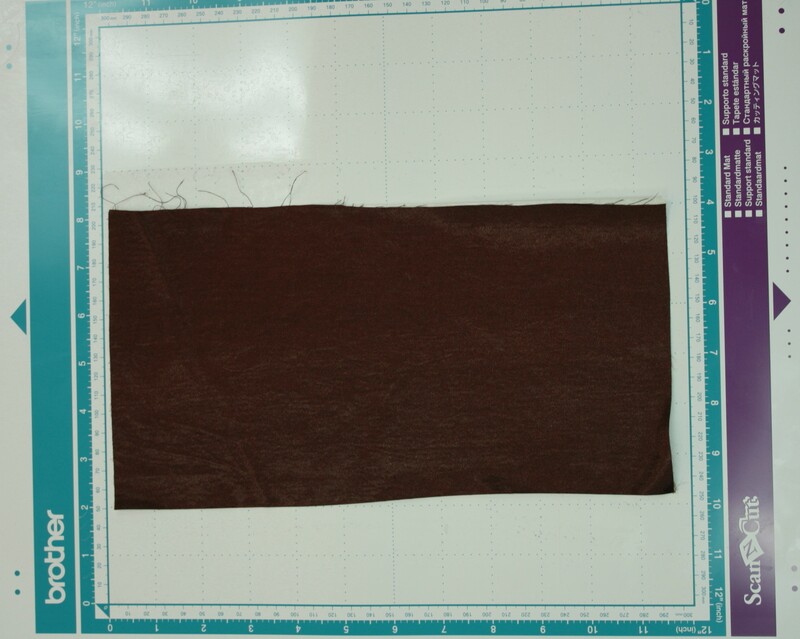 The front pockets were already attached and the back was finished, except for the back pocket. 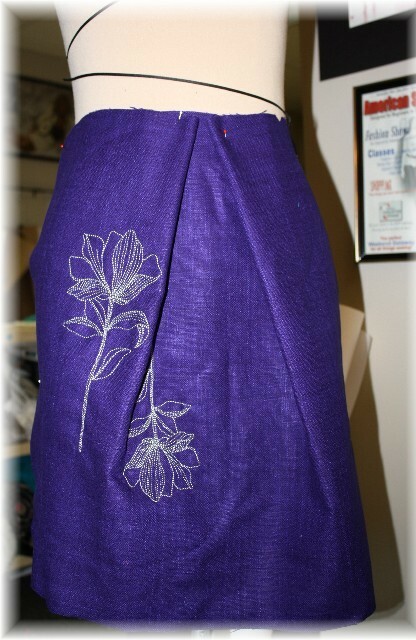 I waited to add the back pocket because I was worried the fabric would be too thick under the embroidery hoop. You can see how the design started large near the hip, then smaller, and then even smaller at the ankle. Just a touch of ideas and I am going to give them a try over the summer, looking into my fall wardrobe. I don’t expect them all to be a success, but I know this will be fun! So to kick off my experiment I thought I better learn how to embroider. These jeans were my first embroidery project last May, not too shabby if I don’t say so myself. The jean pattern is an altered version of my Angel Bootcut Jean and the embroidery design I created on Brother’s Dreamweaver . 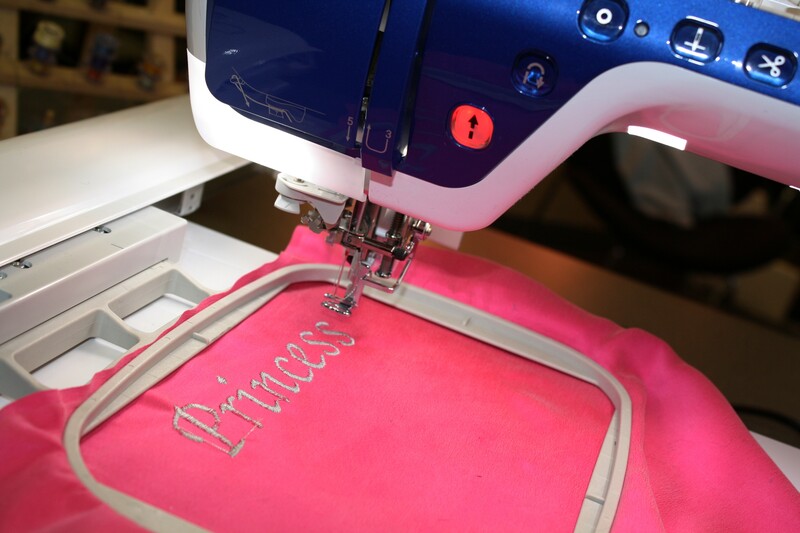 Trust me, I had no idea what I was doing but these new embroidery machines tell you what to do! I sewed the jeans in a little different order starting with the front and back pockets and then the outside seam. A bit of a risk, after all that work, that the embroidery turns out awful. 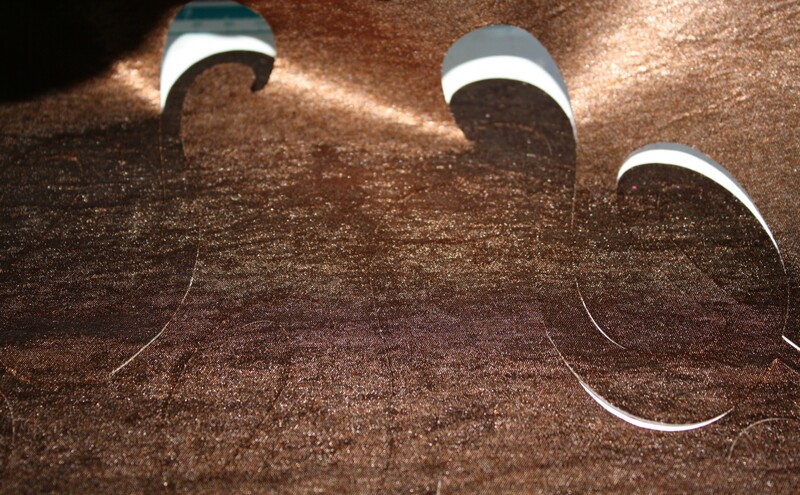 Looking back, you would think I would have tested the design on something, even a scrap of fabric. I am too stubborn for that. 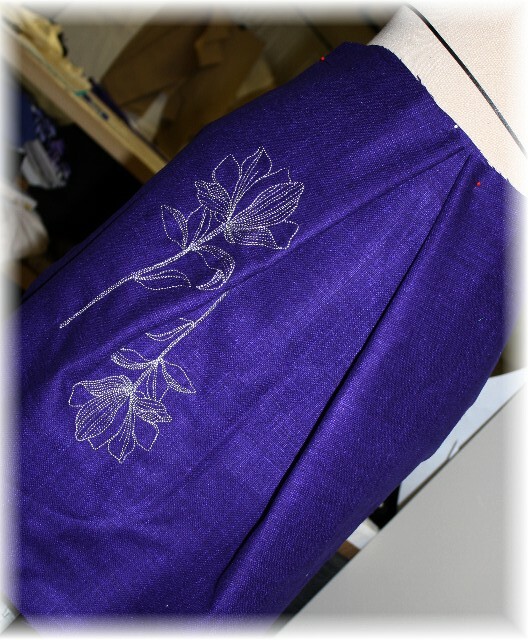 Each leg took 3 hooping’s and at first the total embroidery hours for both legs was tallying up to be 26 1/2 hours … YIKES! 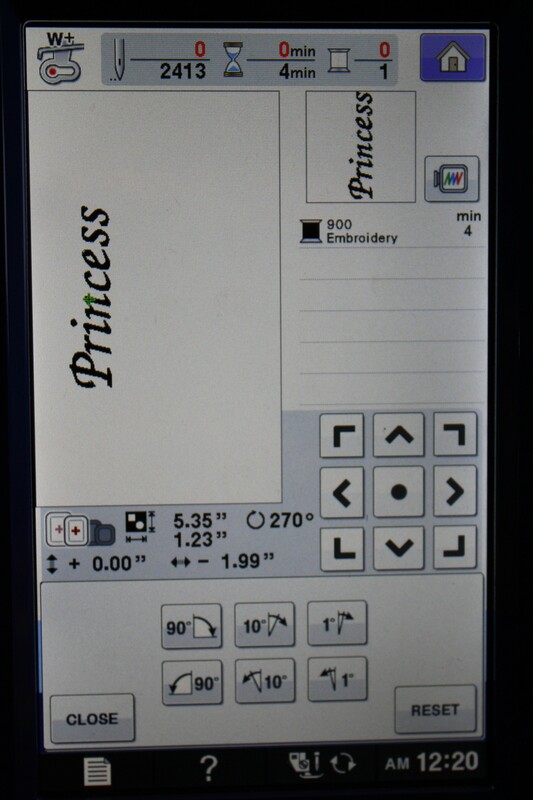 Then I realized that each color would only embroider for a few minutes and I would have to keep changing threads (this is only a one thread embroidery machine, in case you might think I have the fancy one). I decided to change the order of color, even if it altered the final design. 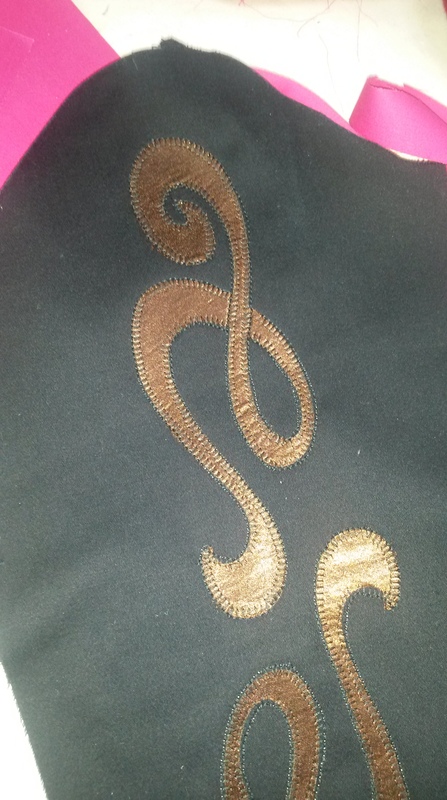 The embroidery design: I changed the design from being a little larger in the top (1st hooping) a little smaller in the middle (second hooping) and really small at the ankle (third hooping). Minus a few mistakes (which I won’t point out :)) I was really pleased with the final results. 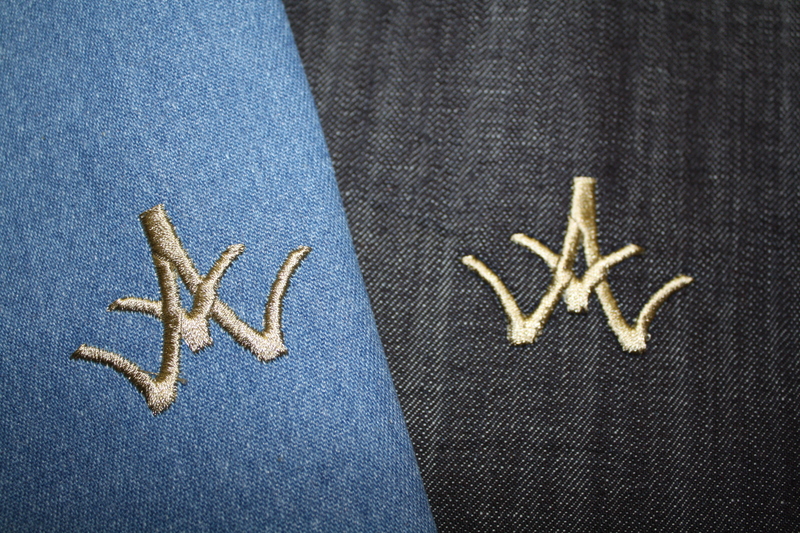 One thing I learned with embroidering stretch denim – after you embroider, the denim doesn’t stretch. Just keep that in mind and make alterations to your pattern to allow for that non-stretch, especially if you are sewing skinny jeans or jeggings. 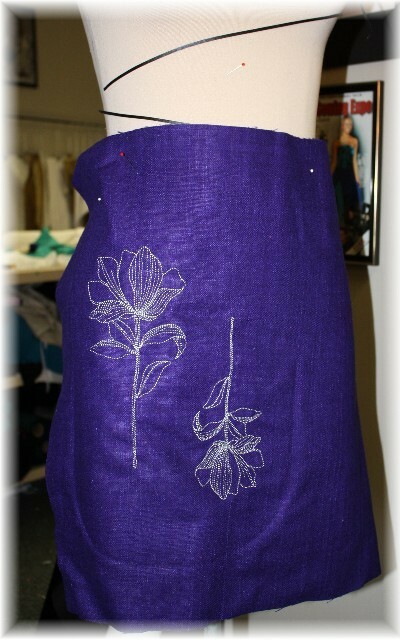 I am planning on embroidering another pair of jeans with all one color of thread, I am thinking black fabric with silver thread or something along that line. Any embroidery tips for me would be greatly appreciated, I have a lot of fabric I want to try (especially silk charmeuse). There is so much to learn and take into account. 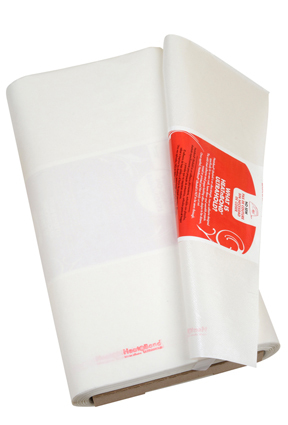 For example, embroidery thread. There are a ton of choices, any advice on the what’s the best and why? I would love to know the scoop! I have been putting off trying this software out for the simple fact I don’t have the time to learn an entire new program. 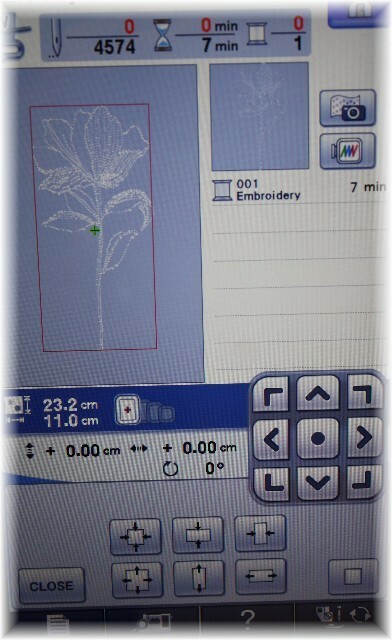 Little did I know that in less than 30 minutes I would have custom embroidery at my fingertips! 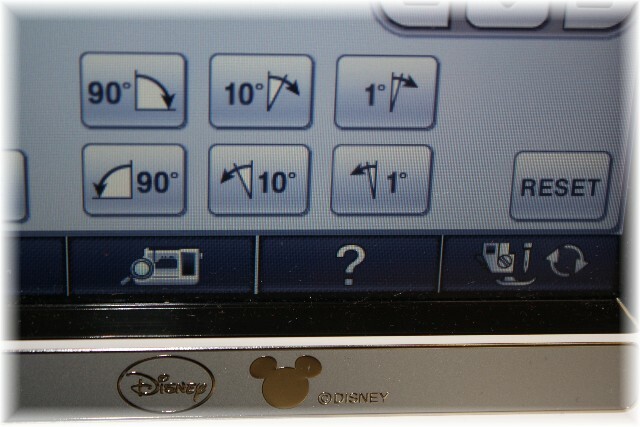 This software is so easy to use, the navigation, the titles, the options, etc. That’s why I am sharing this quick video with you, just in case you are thinking of upgrading to Brother’s PE-Design Next software, it is totally worth it. Now I have all weekend to create new designs, can’t wait! I even noticed I can upload a picture for embroidery, that’s a little scary LOL! 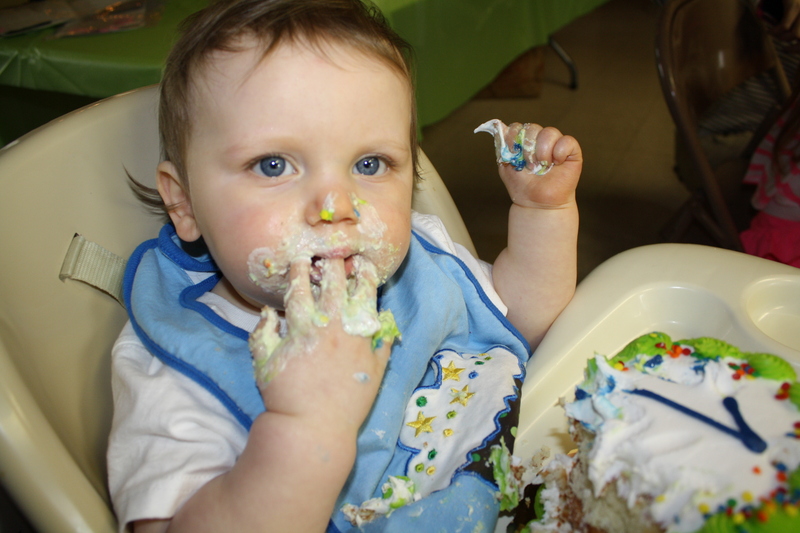 Although, I have some cute pictures from my nephew’s 1 and 2 year birthday party last weekend with lot’s of colorful cake. I wonder how many colors of embroidery thread I am going to need for this?